Delicate crystal knobs paired with slim and stylish Art Deco plates were all the rage in the 1930s. Cheerful, bright and beautiful, they are just as appealing today. 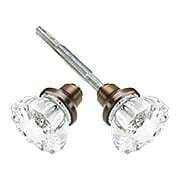 These top-quality reproductions are made of sparkling 12% lead crystal, set into a durable forged brass base. These handsome round glass door knobs are an economical replacement for missing or damaged knobs. 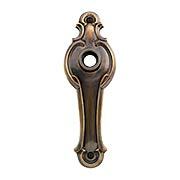 Made of genuine glass with a brass plated zinc base, they offer vintage style at an affordable price. The brass finish is lacquered to preserve the shine. 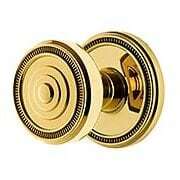 These cheerful fluted door knobs are an economical replacement for missing or damaged knobs. Made of genuine glass with a brass plated zinc base, they offer vintage style at an affordable price. The brass finish is lacquered to preserve the shine. 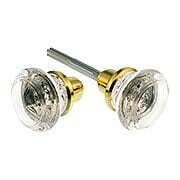 A classic from the 1930s, our Fluted-Glass Door Knobs with Plated-Zinc Base add sparkling style to any room. They feature high-quality, clear glass and are available in an array of classic finish options. Sparkling, fluted glass knobs were a popular choice in the 1920s and 30s. Bright and cheerful, these small knobs paired well with the slim and stylish Art Deco hardware of the day. 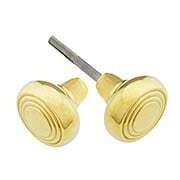 Offered here with a solid brass shank in 4 classic finishes. Sleek and understated, this Streamline Modern door plate is ideal for Art Deco or Mid-Century homes. 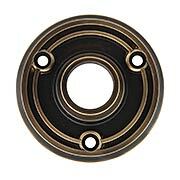 Originally produced in stamped steel, our heavy duty reproduction is forged from solid brass. 2 1/4" wide it works on pre-drilled doors and with vintage mortise locks. Sparkling, fluted glass knobs were a popular choice in the 1920s and 30s. Bright and cheerful, these small knobs paired well with the slim and stylish Art Deco hardware of the day. Presented in our exclusive Antique-by-Hand finish, they age gracefully over time into a beautiful natural patina. Delicate crystal knobs paired with slim and stylish Art Deco plates were all the rage in the 1930s. Cheerful, bright, and beautiful, they are just as appealing today. These top-quality reproductions are made of sparkling 12% lead crystal, and the durable, forged-brass base comes in our exclusive Antique-By-Hand, a living finish that ages gracefully over time into a beautiful natural patina. This handsome rosette is a reproduction of an early 20th century design. The symmetrical profile and embossed lines make it a great choice for a wide variety of styles from Neo-Classical to Art Deco. Made of forged brass, it's available in five classic finishes. Not for use on pre-drilled doors. This handsome rosette is a reproduction of an early 20th-century design. The symmetrical profile and embossed lines make it a great choice for a wide variety of styles from Neo-Classical to Art Deco. Made of forged brass, it comes in our exclusive Antique-By-Hand, a living finish that ages gracefully over time into a beautiful natural patina. Our sleek and understated Streamline Modern door knobs are ideal for Art Deco or Mid-Century style homes. 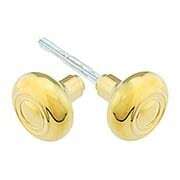 Forged in solid brass for enduring quality, they come in your choice of seven classic finishes. 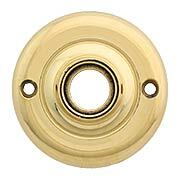 Pair with the matching back plate (RS-01NW-702426X) or combine with your own vintage escutcheons. A threaded steel spindle is included. Sleek and understated, this Streamline Modern door plate is ideal for Art Deco or Mid-Century homes. 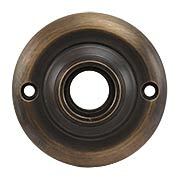 Originally produced in stamped steel, our heavy duty reproduction is forged from solid brass. 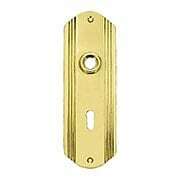 With a 2 1/4" width, it works on pre-drilled doors and with vintage mortise locks. Choose from seven classic finishes. With its classic indented design, this robust rosette is ideal for a variety of interiors. Made of solid forged brass, it comes in your choice of five popular finishes. It looks wonderful paired with our matching (RS-01BM-8745X), glass, or plain knobs. Not for use on pre-drilled doors. 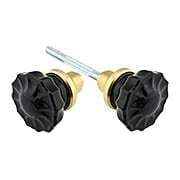 Sleek and understated, these fashionable knobs are a tasteful choice for your vintage Deco or Mid-Century style home. Hollow, yet sturdy, they are made of solid, wrought brass, offering a lifetime of beauty and performance. Available in five classic finishes, you'll have plenty of options for every room in the house. 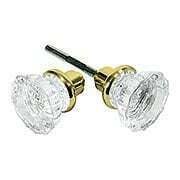 Sparkling fluted glass knobs were a popular choice in the 1920s and 30s. Bright and cheerful, they pair well with the slim and stylish Art Deco hardware of the day. Our modern reproductions are made of top-quality black crystal glass and a solid brass shank for added durability. 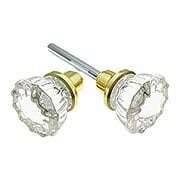 Sparkling fluted glass knobs were a popular choice in the 1920s and 30s. Bright and cheerful, they pair well with the slim and stylish Art Deco hardware of the day. Our modern reproductions are made of top-quality blue crystal glass and a solid brass shank for added durability. Sparkling fluted glass knobs were a popular choice in the 1920s and 30s. Bright and cheerful, they pair well with the slim and stylish Art Deco hardware of the day. Our modern reproductions are made of top-quality emerald crystal glass and a solid brass shank for added durability. 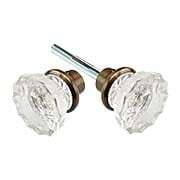 Sparkling fluted glass knobs were a popular choice in the 1920s and 30s. Bright and cheerful, they pair well with the slim and stylish Art Deco hardware of the day. 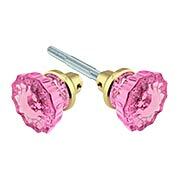 Our modern reproductions are made of top-quality pink crystal glass and a solid brass for added durability. With its classic indented design, this robust rosette is ideal for a variety of interiors. Made of solid forged brass and presented in our exclusive Antique-by-Hand finish, it ages gracefully over time into a beautiful natural patina. Not for use on pre-drilled doors. Sleek and understated, this Streamline Modern door plate is ideal for Art Deco or Mid-Century homes. 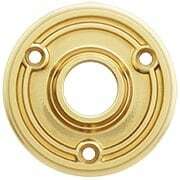 Originally produced in stamped steel, our heavy duty reproduction is forged from solid brass. With a 2 1/4" width, it works on pre-drilled doors and with vintage mortise locks. Presented in our exclusive Antique-by-Hand finish, it ages gracefully over time into a beautiful natural patina. 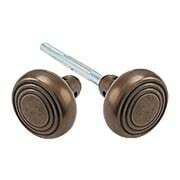 Our sleek and understated Streamline Modern door knobs are ideal for Art Deco or Mid-Century style homes. Forged in solid brass and presented in our exclusive Antique-by-Hand finish, they age gracefully over time into a beautiful natural patina. Comes complete with threaded steel spindle. The Grandeur Soleil Rosette Door Set with Bordeaux Crystal-Glass Knobs is a delightful mix of traditional styles. Constructed of solid forged brass, this elegant design is exhibited in refined detail, while smooth, yet sturdy mechanics offer silk-like operation. Easy and quick installation makes restoration or new construction efficient and exact. 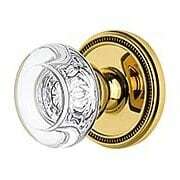 The Grandeur Soleil Rosette Door Set with Soleil Knobs is a delightful mix of traditional styles. Constructed of solid forged brass, this elegant design is exhibited in refined detail, while smooth, yet sturdy mechanics offer silk-like operation. Easy and quick installation makes restoration or new construction efficient and exact. Our Edward Narrow Door Plate is an Art Deco take on Colonial-Revival style. This graceful design pairs perfectly with crystal knobs. Beautifully forged in solid brass, it is left unlacquered, allowing it to age gracefully over time, just like the antique originals. 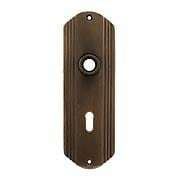 Our Edward Narrow Door Plate with Keyhole is an Art Deco take on Colonial-Revival style. This graceful design pairs perfectly with crystal knobs. Beautifully forged in solid brass, it is left unlacquered, allowing it to age gracefully over time, just like the antique originals. 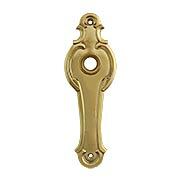 Our Edward Narrow Door Plate in Antique-By-Hand is an Art Deco take on Colonial-Revival style. This graceful design pairs perfectly with crystal knobs. Beautifully forged in solid brass, it comes in our exclusive, living finish that ages gracefully over time into a beautiful natural patina. Our Edward Narrow Door Plate with Keyhole in Antique-By-Hand is an Art Deco take on Colonial-Revival style. This graceful design pairs perfectly with crystal knobs. Beautifully forged in solid brass, it comes in our exclusive, living finish that ages gracefully over time into a beautiful natural patina.